17 August 2010, at 8:11a.m. US - For more than four decades, poultry production experts from academia and industry have gathered to share their insights with production managers from around the world at the annual Aviagen Production Management School. The intensive four-week course, held this year from 6 June to 2 July in Huntsville, Alabama, provides industry up-and-comers with the latest technical information and best management practices in the poultry production industry. Neal Scanlon, director of the school and vice president of Asia region for Aviagen, explained: "The vision of the Aviagen School remains focused on helping the next generation of production managers prepare for success in the global poultry industry. The School is the perfect environment for learning from some of the leading educators and specialists in their field, while providing an atmosphere uniquely designed to encourage networking that helps participants establish lasting relationships." Starting in the late 1960s as the Arbor Acres School in Connecticut, the School has grown dramatically in size and scope over the years. 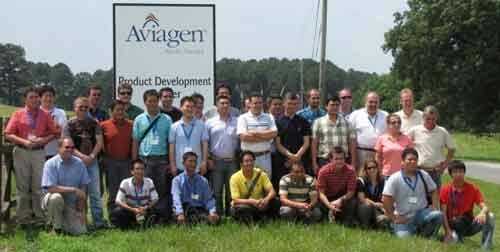 Since it inception, more than 1,000 men and women from over 100 countries have successfully completed the Aviagen School. This year, the School welcomed 32 Aviagen customer participants from 19 countries and featured 41 speakers from academia and industry. Students encountered a rigorous pace of 53 classroom sessions, eight hands-on practical workshops or labs, and 10 live production facility visits, with weekly written exams over four consecutive weeks that culminated in a graduation dinner and ceremony. The breadth of topics covered during the course included nutrition, veterinary, hatchery operations, production and farm management tools and techniques. Jorge E. Amado Mojica said: "Being a part of the Aviagen school was a dream I have had for many years and an event that I will never forget. Over the course of four weeks, I learned a great deal from the highly qualified speakers and my many new friends from around the world. But the real experience was the exceptionally good care and support of the Aviagen staff. They exceeded my expectations." Annual enrollment to the Aviagen Production Management School is limited to Aviagen customers and qualified applicants are chosen from eligible applications. To learn more about the School, visit the web site [click here].